Two new clips have been released from Jon Favreau's upcoming sci-fi western movie Cowboys & Aliens. The Clips feature Harrison Ford & Daniel Craig kicking up a mighty s**tstorm. The 43-year-old Craig stars as a cowboy who meets Jake Gyllenhaal on a lonely mountain road ..no wait, who has no memory of his past and the only key to his history is the mysterious shackle that encircles one of his wrists. The stranger wanders into the town "Absolution", which is attacked by "strangers" from the sky that abduct the helpless one by one & bring up many questions for the locals. The movie also stars Olivia Wilde. Directed by Jon Favreau the movie is based on the 2006 graphic novel of the same name created by Scott Mitchell Rosenberg. 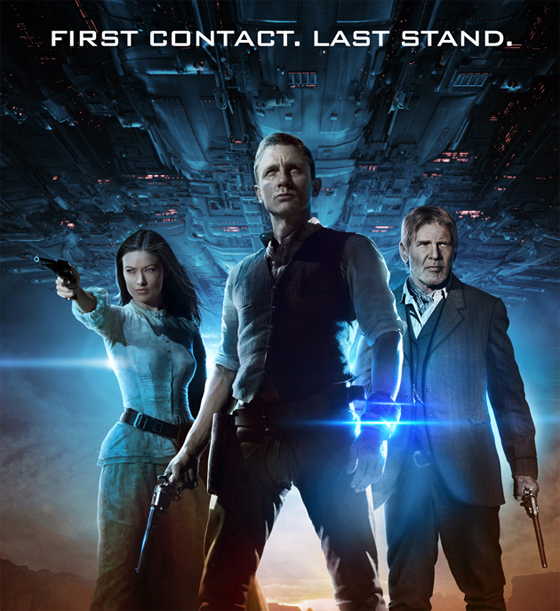 Cowboys & Aliens hits theaters July 29th 2011. Hit the jump to check out the clips which come via TrailerAddict. I'm reading: Paramount Release Two Clips for their Upcoming 'COWBOYS & ALIENS'Tweet this!